On the side of one of the hills was a child friendly space, clinging onto the edge of a small piece of dirt, shaded by a lone tree. A rare splash of colour and sound in the eerily quiet, monotonously orange and white camps where the only other consistent sound was raspy coughing. We stepped into a room full of children who had seen more trauma in the last two weeks than most people have seen in our whole lives. Tiny, unseeing eyes, tired, cut and bruised feet and hands who have carried siblings and solar panels for days, holding onto pencils and toys. They spoke as if they were 60 years old, and yet not one had turned six. We talked to Amin who looked at us with a vacant face and said, “I watched my daddy get killed. They found him in the forest and cut him and I saw the blood.” He did not cry, describing the torture with a completely normal face as if he was talking about what his house looked like. The painting in front of him had a person with blood coming out of his head, guns pointed at flailing hands, bodies in piles on the ground and a helicopter in the sky. Some children fought, others looked disinterested and stared blankly at the wall, and others peered around nervously at others. They threw the toys and pushed each other. The facilitators were trying hard, but keeping the children engaged in a completely unfamiliar place was not an easy task for anyone. One of the children started to sing an angry song, and another started to cry. Of the million people who now live in the camps of Cox’s Bazar, Bangladesh, UNICEF estimates that half of them are under 18. The world is now witnessing the highest levels of displacement on record, with UNHCR estimating that we have nearly 25.4 million refugees, over half of whom are under the age of 18. BRAC quickly realised that it would have to invent a new model. The facilitators started by asking the children a single question, what did you like doing in Myanmar? With that, a treasure chest was unlocked. Boxes of Monopoly and Scrabble were removed and practical toys such as cars, cooking sets and dolls were introduced. Time and space was set aside for physical play. Boys and girls made human pyramids shaped like elephants and playing skipping games. 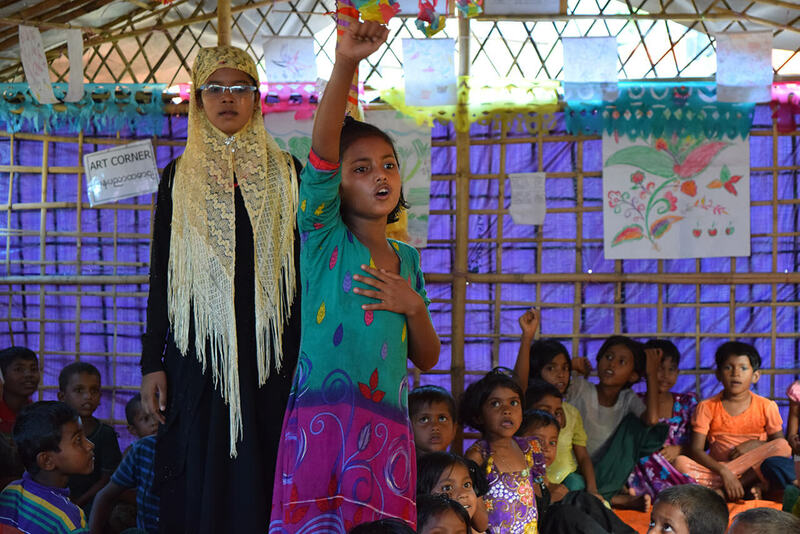 Facilitators heard children chanting kabbiyas (traditional Rohingya rhymes) and asked the children to help them learn the words. Specific times for recitation were set aside each day. The sound turned into a constant beat in the camps. Facilitators learnt the rhymes and started developing them into a cultural anthology. Various research has shown that chanting has enormous positive effects on human cognitive abilities. A study done by Alfred Tomatis of the French Academy of Science and Medicine found that chanting sounds have a therapeutic effect on the body. According to research done at the Cleveland University, the rhythmic tones involved in chanting create a melodious effect in the body called the neuro-linguistic effect. When we know the meaning of what we are reciting, it creates a psycholinguistic effect on the body. A study by Dr Alan Watkins revealed that while chanting, our heart rate and blood pressure dip to its lowest in the day, and that it promotes a sense of wellbeing and helps us bond better with people around us, especially when practiced in a group. Structure was introduced. While child friendly spaces are open for children of all ages all the time, opening hours were divided into specific time slots where children of specific ages were welcome. The first two hours were for children aged 2-6, the second two hours were for children ages 6-14, there was a break when children would go home for lunch and usually religious practice, and then the space would open in the afternoon for all ages. Children talked a lot about revenge, and wanting to kill people who had wronged them and their family members. Not only were strong child protection and mental health components needed, but parents also had to be supported. We found out quickly that there was very little understanding among the newly-arrived community that people experiencing trauma need support. Mental health and child protection pathways were developed. Frontline staff, known as barefoot counsellors, became the first point of contact, and received basic training and monthly refreshers in child protection and mental health. Barefoot counsellors were supervised by para-counsellors. One psychologist was assigned to help every five para-counsellors, and extreme cases were referred to public and private psychiatrists. High levels of post-traumatic stress disorder, depression and grief were reported by staff at all levels. Parents needed skills to support their children. 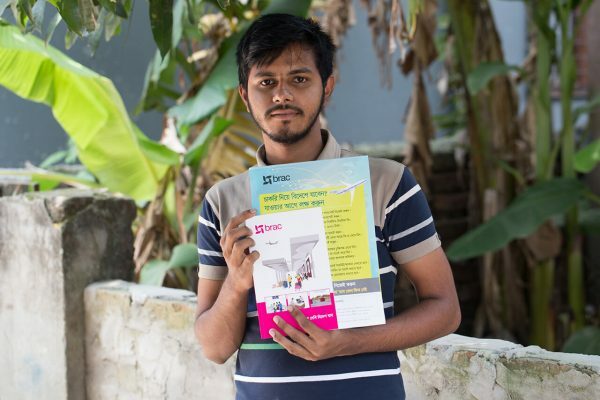 A home-based prevention and case management outreach approach was implemented, with the para-counsellors tasked with regularly visiting 25 households each surrounding BRAC facilities. Two facilitators looked after each space, one from the host community and one from the Rohingya community. The facilitators were trained for ten days in play therapy and art, as well as mental health and child protection. Refresher sessions were held every month. The facilitators were young and mostly female, and learning themselves as the spaces developed. For most of them, this was their first job, and the first time that the Rohingya women had spent significant time outside of the house. It was a journey for all involved. After the first three months, which focused just on listening and learning about their culture and giving it back to them, focus group discussions began. Topics covered included what early childhood development meant in the Rohingya community, when should learning start and what role should play have in that. The discussions revealed that there was no concept of pre-primary education. Parents taught children basic pre-math and language, and then school began. We collected the informal pre-primary lessons that they taught and added them to the anthology. It took one year to set the basic components of the model. Three objectives had emerged; create a space that is safe, one that nurtures children’s natural spontaneity, and ensure that it preserves the culture of the Rohingya. A curriculum keeping these three principles in mind was developed from the anthology of learning gathered over the past twelve months. The Humanitarian Play Labs sound like happiness. Hordes of children welcome visitors loudly and warmly, and give them pictures of people playing, colourful flowers and trees. Play leaders struggle to contain the children’s enthusiasm for singing and dancing. What brought about this change in their behaviour? Time, of course, but these little hubs of fun undeniably also had a significant impact – just ask any of the parents peering in through the windows, or the passersby pausing to enjoy the rhythm of the singing and playing. It’s not just the children that are calmer, but the whole community. The spaces have brought a new rhythm to the settlements, and act as a string of sanctuaries for the generation that everyone in the community cares the most about. While the main tenets of the Humanitarian Play Lab have been set, it will continue to develop. For example, it was noticed that kissa (traditional folk tales) are known by most children. The tales are being documented and added to the anthology. With the help of a team of volunteer architects, fathers are adding verandahs to the structures, mothers sewing the shamianas (traditional ceiling decorations made of coloured cloth) and children painting the walls. The spaces also now have their own name in the Rohingya language – kele peeye neyora – (universe of play). A census is also currently being undertaken that will check on the status of children in every household in the camps. 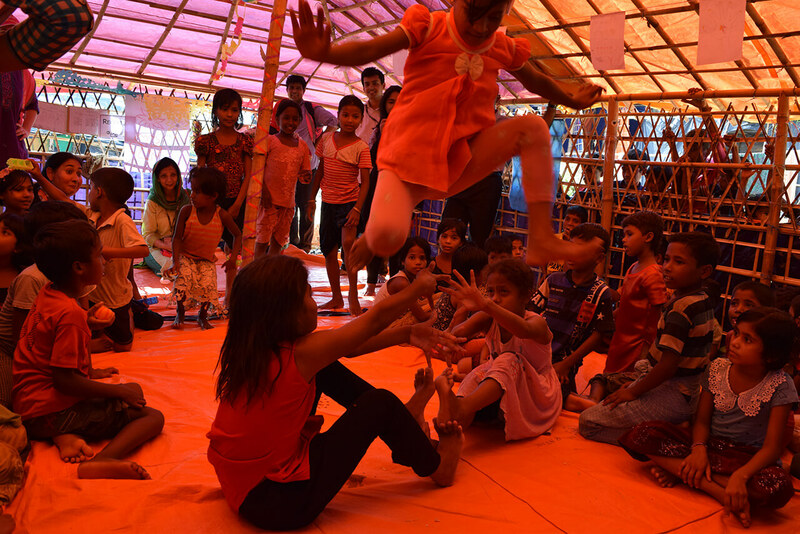 The Humanitarian Play Lab model is an extension of the Play Lab model, created by architects and play scholars from around the world, which has been operating for the last three years in Bangladesh, Uganda and Tanzania. The basic idea is to ensure children in poor communities – and now displaced and refugee settings – can access activities that neuroscience shows helps to build young brains. The focus is on children aged 0-6, the years when the most significant part of a child’s cognitive development happens. The central tenet is that a child’s brain will be approximately 80% the size of an adult brain at just three years old. The difference between Humanitarian Play Labs and Play Labs is the addition of playing to heal, as well as playing to learn. Researchers argue that the potential benefits of play are enormous, extending beyond simply making kids ready for school to helping them prepare better for life. For children in a humanitarian crisis, the impact is even more powerful. If you want to see what play can do, there is no more clear evidence than in these colourful drawings, in the children’s self-esteem, and in the way that these children engage, make teams and cooperate. BRAC is now scaling these play labs up to reach 70% of the Rohingya children aged 0-6 as well as children in the communities surrounding the settlements. As child friendly spaces are a well-known concept in the humanitarian sector, Humanitarian Play Labs will operate within child friendly spaces. The current 242 spaces for children in the camps will be 500 by the middle of 2019 and is planned to reach 1,000 by the end of 2019. 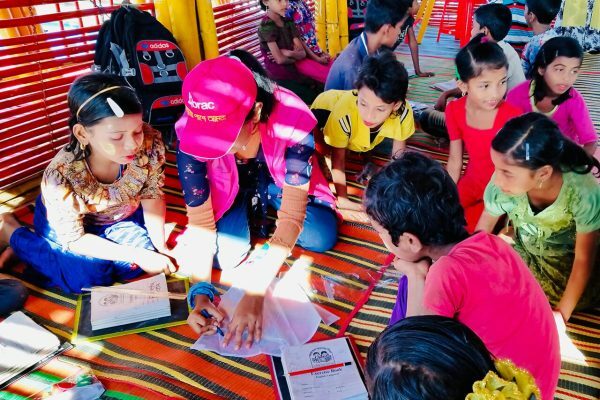 In a world where nearly one person is forcibly displaced every two seconds as a result of conflict or persecution, and in Cox’s Bazar, where 60 babies are being born each day, Humanitarian Play Labs hold an important key to making sure all of our smallest generations get the biggest start in life. Dr Erum Mariam is the executive director, Institute of Educational Development, BRAC University. Sarah-Jane Saltmarsh is the head of programme and enterprise communications, BRAC Communications.